A campus Republican group has apologized for making and distributing an anti-Semitic Valentine's Day card to students at Central Michigan University after an image of the card went viral online. University officials began investigating the incident on Wednesday after a pair of students received the card that mocked Jews who died in the Holocaust. An image of the card was later posted to Facebook and was shared over 900 times before being taken down on Thursday. @CMUniversity is one of the 150 programs NAZIsm ? @CMUniversity as you should be! What kind of parents do these children have?Certainly not future Role Models.It's disgusting and disturbing! @CMUniversity And if this were a Greek organization, there would have been SWIFT consequences. RSOs should be held to the same standard. 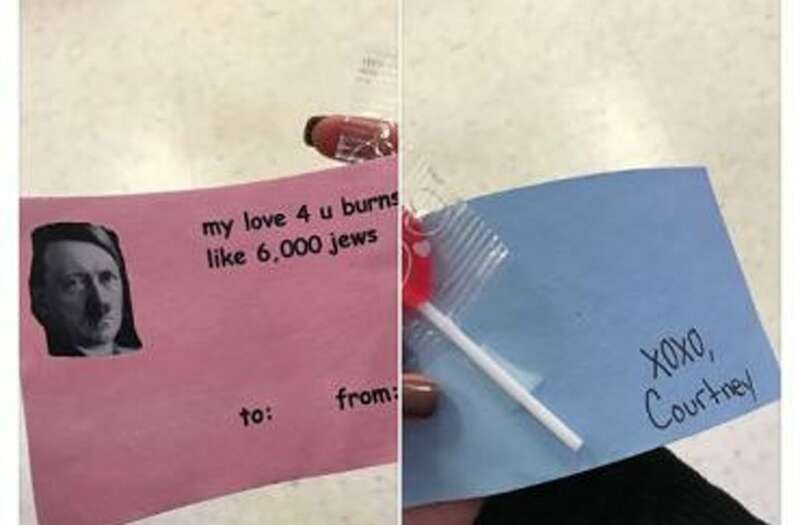 The Valentine's Day card, which was handed to the students by a member of the College Republicans group, had a picture of Adolf Hitler and read "my love 4 u burns like 6,000 jews," according to Central Michigan Life, the university's school newspaper. A member of student group posted a statement on the College Republicans Facebook page the following morning denying any knowledge of the card and apologizing for its offensive content. "At tonight's College Republican meeting, we had a Valentine's Day party, in which each member decorated a bag and other members placed valentines (cards) inside of others' bags," the statement reads. "Unfortunately, a very inappropriate card was placed into a bag without other members' knowledge. A bag was then given away, once again without members' knowledge of its contents." "The College Republicans as an organization did not distribute this valentine. We in no way condone this type of rhetoric or anti-Semitism. We apologize for any offense, and want students to know that we do not tolerate this sort of behavior." University President George E. Ross said he is "deeply disappointed" in the campus group in a statement released Thursday. "​This is not who we are as a campus community," he said. "Such hurtful, offensive language, while protected by the First Amendment, is unacceptable and is not consistent with our values and standards." Ross said campus leaders gathered on Thursday morning "to review the situation and determine next steps." However, he added that school officials use "caution against concluding that the action is representative of the entire student organization or its members."